A common complication after head trauma is hydrocephalus, a condition in which there is a build-up of cerebrospinal fluid (CSF) in the ventricles of the brain. 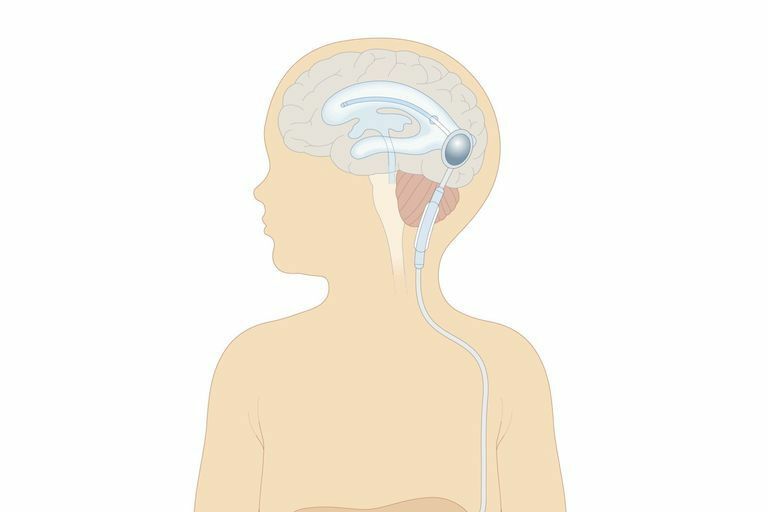 One treatment for hydrocephalus is the placement of a shunt. A shunt is a long, flexible tube with a one-way valve. After it has been determined where there is fluid buildup in the brain, the shunt is placed and then tunneled into an area of the body where it can drain the excess fluid. Ventriculoperitoneal: drains the fluid out of the affected ventricle of the brain and into the abdominal cavity. This is the most common type of shunt. Ventriculoatrial: drains fluid out of the brain and into the atrium of the heart. Ventriculopleural: drains fluid out of the brain and into an area around the lungs. This is the least common type of shunt. In specialized cases, there are some additional drainage options for shunts. These are determined on a case by case basis by the neurosurgeon who will decide on the best surgical treatment. The goal of treatment when a shunt is placed is to drain the right amount of fluid out of the brain's ventricles, and also ensure that no fluid flows back up the shunt and into the brain. This is accomplished by a one-way valve. As cerebrospinal fluid builds up in the affected ventricle of the brain, pressure increases. The one-way valve opens when a specific level of pressure is reached inside the ventricle, and then closes again when that pressure normalizes. This helps to prevent too much fluid from being drained. The one-way valve ensures there is no risk when lying down, leaning forward, or hanging upside down, of any fluid backing up into the brain. There are many shunt design types. Some of them have a reservoir which specialists can use to draw off fluid for future testing or inject medications such as antibiotics, if necessary. If a shunt fails it may be necessary to remove the shunt and treat any underlying complications, such as infection or bleeding. Then, depending on whether or not hydrocephalus continues to be a problem, place a new shunt or explore other treatment options. Depending on where the shunt is located, there may also be abdominal pain or the ability to feel an enlargement around the shunt drainage site in the abdomen. Radiologic testing can help diagnose the presence of infection, a cyst around the drainage end of the shunt, increased fluid inside the brain which indicates the shunt is not working properly, and other complications. When trying to decide if a shunt is the best option, it’s important to talk to the treatment team and specialists who are familiar with the underlying head trauma. Learn why hydrocephalus developed, and how the shunt will help. Hydrocephalus is a serious condition which can lead to death. A shunt is a treatment option that may reduce the risk of death from hydrocephalus. Why it's Tricky to Diagnose Normal Pressure Hydrocephalus? Is the Brain's Right Hemisphere More Emotional?